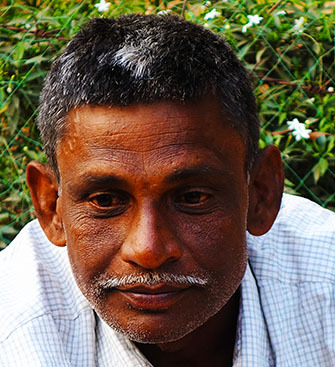 Shantanu Patua was the last of the Birbhum school of patuas. He was the eldest son of the renowned Banku Patua and his wife Bhairabi, started his training at the age of eight, under the watchful eyes of his famous father. He would observe his father at work and then emulate him by tracing drawings on the mud floor, or he would draw outlines on mud walls and fill them with paint. He gradually shifted to the medium of paper and also learnt to sing from his father, his guru. Shantanu would later visit Kolkata often, accompanying his father at workshops and exhibitions. 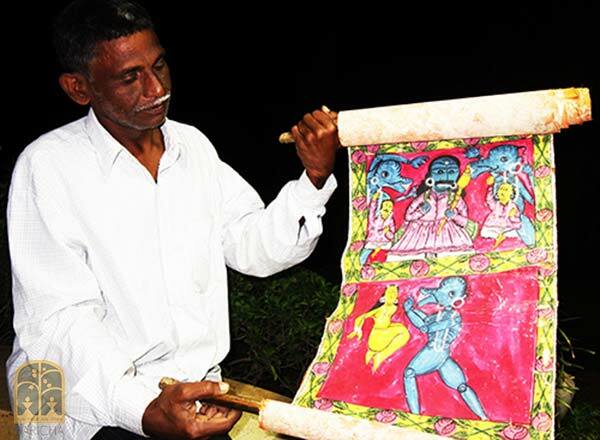 Banku Patua, who died in 2006 at age of 66, was probably the last bastion of the Birbhum school at a time when patachitra artists around most of the districts of Bengal, barring Medinipur, were putting away their scrolls and paints. Banku had learnt from his paternal uncle, the late Bhupati Patua , who was both an image maker and a potua and singer. Shantanu speaks with pride of his grandfather, Bhupati who was one of the patuas that Gurusaday Dutta had encouraged during his official stint at Birbhum in the 1930s`s. Banku went on to achieve fame with his distinctive style of painting in the Birbhum genre. He was also presented at various exhibition spaces abroad by the renowned art curator, Rajeev Sethi. However, interest in the stylistically different Birbhum school seems to have petered out with the death of Banku. The massive steps that had in the meanwhile been taken to promote the Medinipur patachitra further deepened the crisis for the Birbhum artists. Thus, in Birbhum today, the few patuas that survive still walk miles each day , visiting villages and singing for their survival, just as they did a century ago. In the twilight of their lives, and often without food and warm clothing, the struggle for their art is relentless. The quiet, self effacing and extremely talented Shantanu Patua, spoke lightly of his daily struggle and how the balance was tilted against them. He and his small community, comprising primarily his brothers and members of his family, were demoralized by the complete absence of recognition, promotion, marketing, and training opportunities that have been so generously afforded to Medinipur artists. Though Banku modelled clay sculptures as well, Shantanu focussed on pata painting as his livelhood. His daily routine comprised walking barefoot to villages about 8-9 km away, after a light meal. He would set out early and reach a village by 10 am. Visiting 30 - 40 homes in each village, he would stop at each homestead, displaying his scrolled pata and singing the associated song. The older people in general would request him for more songs and invariably he was invited to share a family`s meal. At other times, he was gifted rice, potatoes or seasonal vegetables by the villagers. In the late afternoon, he would slowly make his way back home with whatever food he managed to collect. This practice continues to this day, barring the monsoons, Thursdays, the days of Amabashya (dark moon) and Purnima (full moon) when food or alms are not distributed in the villages. He paints on these days. His most popular pata among the farming community was the Goru Pata, based on the Kapila Mangal from the Mangal Kavyas. Shantanu was the recipient of district and state awards and also visited Japan in 1995. Shantanu used only natural clay and plant based colour and all his brushes were handmade. His wife and son also paint patachitras. He has only recently managed to acquire an artist card, but his family continues to wait anxiously for their cards. Shantanu had collaborated with a German artist to produce a series of folk paintings: Shantanu painted on a German theme, Till Eulenspiegel, as narrated by the German while the latter painted on the popular Gopal Bhand folk tale of Bengal. The character of Till Eulenspiegel in German folklore is a trickster who plays practical jokes on his contemporaries, exposing vices at every turn, greed and folly, hypocrisy and foolishness, much like Gopal Bhand of Bengal. It was also a chance meeting with a Japanese folk practitioner of Kamishibai, a form of Japanese street theatre and storytelling - thus a kind of Japanese patua, according to Shantanu, that culminated in Shantanu`s visit to Japan. Shantanu was also invited to perform a patua song as part of a play in Kolkata at the Minerva theatre. His wonderful experiences and his unique art notwithstanding, Shantanu and his family struggled for survival - for themselves and for their art. And now that Shantanu is no more, having succumbed to a heart attack on February 11, 2017, at the young age of 52, the Birbhum school is headed for extinction.